a small brown or flesh-colored outgrowth of skin, occurring most frequently on the neck of an older person. Also called cutaneous tag, skin tag. (2) Any papillary growth arising on the skin. the common wart. A benign tumor derived from epithelium, which may arise from skin, conjunctiva, mucous membranes or glandular ducts. Varies from keratinized, to fibrovascular, squamous. 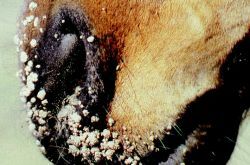 Caused by a species-specific papillomavirus. See also papillomavirus. the common form; distinguishable from papilloma of the esophageal groove and reticulum, bladder. single or multiple, small, benign fibrovascular skin tumors, that occur occasionally on the extremities or ventral thorax of dogs. Called also skin tag, keratin tag, soft fibroma. a rare tumor of the choroid plexus, often causing an internal hydrocephalus.